If your order weighs less than 13 ounces, save huge on shipping with USPS first class (with tracking number). This product weighs 3.4 oz. 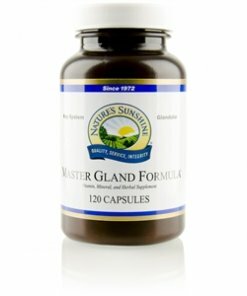 Nature’s Sunshine Master Gland® nourishes the glandular system, providing essential vitamins and minerals key to the production of hormones. 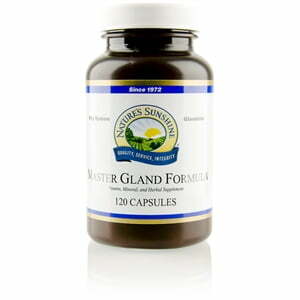 Included in Master Gland® are the powerful antioxidants beta-carotene, vitamins C and E, bioflavonoids, and zinc. The Master Gland® herbal base blends herbs that nourish the pituitary gland, thyroid, adrenal, pineal, and prostrate glands, among others. Licorice root (Glycyrrhiza glabra), Alfalfa aerial parts (Medicago sativa), Asparagus stem extract (Asparagus officinalis), Black Walnut hulls (Juglans nigra), Parsley leaves (Petroselinum crispum), Parthenium root (Parthenium integrifolium), Thyme leaves (Thymus vulgaris), Dandelion root (Taraxacum officinale), Dong Quai root (Angelica polymorpha), Eleuthero root (Eleutherococcus sinticosus), Kelp leaves and stem (Ascophyllum nodosum and Laminaria digitata), Lemon Bioflavonoids, Schizandra fruit (Schisandra chinensis), Marshmallow root extract (Althaea officinalis), Uva Ursi leaf (Arctostaphylos uva ursi), silicon dioxide (powdered silica), gelatin, and water.